Once I stopped holding back, I started to see the difference, not only in me, but also in my students. In the summer of 2008, I got baptized in the Spanish Seventh-day Adventist church in my hometown. I remember wanting it to happen in June, near my birthday, so that I could celebrate my new birth in Christ. I had long suffered from bitterness and anger caused from living in the world and apart from God. I went through many difficult experiences and hard-learned lessons. But one night, shortly after graduating from University, I got tired of my empty lifestyle, and cried out to God to help me change. I told Him that I could not make the change on my own, but that He needed to help me change. That was about 3 to 4 years before I got baptized. When I first came back to church with my mom, I noticed an advertisement in a small magazine. It was about South Korea. I had just come back from teaching English in Taiwan (not through the church) and it had left me with the itch to travel again. I wanted to go, but somehow I felt that I was not ready yet. A year went by and the idea kept coming back to me, so I decided to start the application process. I started the online course to prepare myself and I read the book “Passport to Mission,” as was required. My initial target date was for October, and then December, but it just wasn’t happening. I didn’t know why it was taking so long, but I didn’t give up. Finally, everything was set for my February departure except for my Visa. I still needed to get that done and with only three days left before my deadline, I drove 6 hours to Houston, Texas, to pick up my Visa at the consulate. About half a minute after I prayed, the song I had asked for came on the radio. I laughed and cried at the same time, but with joy, for God had heard me and answered me! When I first arrived in South Korea and met people from my orientation group, I felt a little bit like an outsider. Almost everyone was born into the Adventist faith except for me. I had come from the world; I wasn’t raised with Bible stories at home or anything like that. Some people, younger than me, had already volunteered in many countries. I felt like I was just starting out. After the first two weeks, I was sent to my destination in Bucheon. Feeling jet lagged and overwhelmed, I got very nervous about my week of teaching. I thought, God, how am I going to do all that is expected of me while I’m here? But then my coordinator said something to me that was very helpful. She told me to take one thing and one day at a time. I consider myself an organized person and somehow her simple words snapped me out of it and I was able to start prioritizing. It worked! My stress was gone and I just focused on one thing at a time. I set a time for each thing and stuck to it and was able to complete all of my tasks. Korea did challenge me, not just with the language and food (though I really wasn’t having that much trouble with it), but spiritually. As I mentioned before, I had basically come straight from the world, bringing with me a bit of an attitude and bitterness, so I wasn’t very friendly at first, towards one of my roommates. But I know now, looking back, why God put us together. I needed to learn from her example. She was never rude to me, and she bore my character patiently for the first few months. It was also through her that I really learned how to keep the Sabbath holy. She also introduced me to sermons by Henry Wright, Doug Batchelor, and Walter J. Veith, just to name a few. Soon, I bought an mp3 player and started downloading the sermons so that I could listen to them while I was on the bus, subway, and while running errands. Something else that I noticed about my roommate was how easy it was for her to be close to the students. I have never been much into public displays of affection. In Korea, women who are very close friends like to walk arm-in-arm in public. They really like to express their affection towards each other in public. I thought it was very nice and different from my culture back home. I felt bad that I found it hard to connect with my students. I was distant. So, I started praying about it and asked God to give me love for my students. I had a student who was always inviting the teachers out on weekends, especially for Sabbath afternoons. I accepted one of her invitations along with my roommate and we headed towards Incheon Park to close the Sabbath together. It was a beautiful day and we had a nice hike up a hill and rested on some rocks. We sang songs together, read from one of E.G. White’s books, and then took a nap on the rocks! I’m sure our student thought we were weird, but she kept inviting us out. I started spending some weekends with her and soon realized that I had love for her the way God wants us to love each other. I really wanted to see her in heaven! Then I noticed that I had started seeing all of my students differently. I really had love for them. For the first 5 minutes of class, I started to give mini sermons on a Bible verse each day. On our last day of the term, three students asked me questions about the Religion class. They all had decided that in the following term, they would not take a regular English class, but rather sign up for the Religion class. I was so excited and happy! How beautiful it is to see someone open up their heart to God, even if they are only curious at first. When the time came to finish up my one year contract, I started to rethink going back home. 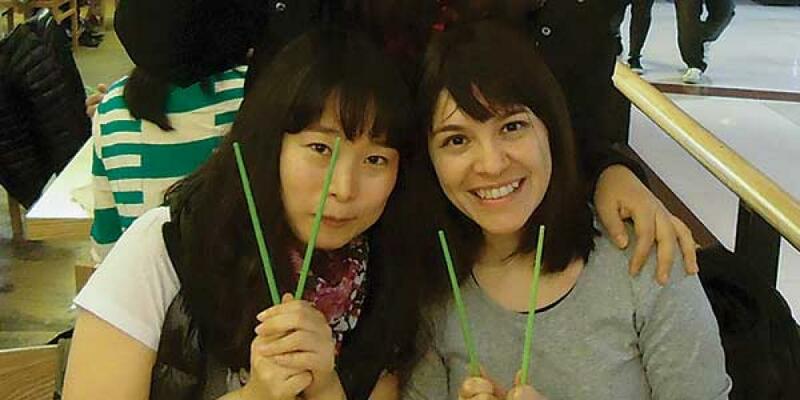 I had just started bonding with my students and Korean co-workers; I was sad to be leaving them now. Their kindness made it very difficult for me to leave, but I also knew that my mom was eager to see me again. I was offered a job in one of the Korean High Schools, just short of leaving, so I prayed about it. I asked God for another sign. Because of the time difference between my home and Korea, I hadn’t been able to keep in touch via phone calls with friends from my church. So, I asked God, “If You want me to stay another year in Korea, then let me receive a phone call about the job from the muksanim (pastor). But if You want me to go home, then let me receive a call from anyone belonging to my home church. Whatever Your will is, Lord, I will do.” The next day was a Sunday. I was about to head out to meet some friends when, all of a sudden, my computer phone rang. It was a call from a friend from my home church. It was time to go home. I still don’t know why God wanted me to come back home. Maybe, I had to return so that changes could be made in my home. Maybe I’m supposed to go back to school. I really enjoyed teaching Religion in Korea and am looking into getting a degree in Religion from an Adventist University. Or maybe I can go back to Korea in the near future. I know my family would be sad to see me go again, but I’m about my Father’s business now. Whatever I end up doing, I know God will always be leading me, and where He leads me, I will follow. Isela Muzquiz is originally from the United States. She served as an English/Religion Teacher in South Korea from February of 2011 to February of 2012. She took a short break and then returned to teaching in September of 2011. She will continue to serve through February of 2012.